There was almost nothing Westworld could have done this week that could compare to the huge twist that took place last week. So they just hit the ground running and went with a "business as usual" approach in Trace Decay, and really laid the groundwork for the upcoming season finale. Well, business as usual by Westworld standards. Let's dig in, shall we? Appropriately, the show started out with Dr. Robert (Anthony Hopkins) talking to his murdering robot buddy Bernard (Jeffrey Wright) about what he had done. Naturally, Bernard had some questions and perhaps somewhat surprisingly, Dr. Robert had answers. But only because he knew he would be wiping Bernard's memory once he was done covering up their involvement with Theresa's (Sidse Babett Knudsen) murder. Oh, and they pretty much pinned all wrongdoing on her, which was pretty messed up. All of this so Dr. Robert could continue being this strange God figure he has made himself to be and finish his precious new narrative. But Charlotte (Tessa Thompson) has her suspicions and is doing what she can to uncover the truth. Meanwhile, Maeve (Thandie Newton) is becoming a God of sorts in her own right. She is still pulling the strings and having Felix (Leonardo Nam) and Sylvester (Ptolemy Slocum) do her bidding. This week, that included reprogramming her a bit more and getting rid of that pesky detonation device in her spine. Oh and Maeve totally cut Sylvester's throat, but he lived. It was truly messed up and now we know she harbors no issue with killing humans so she can escape Westworld. She is getting ready to "assemble her army," which will probably lead to a big battle in the season finale a couple of weeks from now. So we have that to look forward to. It is kind of insane how powerful Felix has made Maeve at this point. That gunfight scene toward the end of the episode was pretty unsettling, considering how much influence she had over what was going on. But she isn't totally in control, because her flashbacks are blending with reality. That will surely come into play at another pivotal moment later on. Not only that, but the park seems to be onto her a bit, so this powder keg is set to blow very soon. Good thing too! Because there are only two episodes left this season. As for our lovely new couple, William (Jimmi Simpson) and Dolores (Evan Rachel Wood), they are still off on their quest for, well, whatever it is they are looking for at this point. It did lead them to the outer edges of the park and to that tower with the cross on it that if you will recall has to do with Dr. Robert's new narrative. Thanks to Dolores' weird dream flashbacks blending with reality in the same way it is happening to Maeve, and thanks to something Charlotte said, we know that is part of an old town from the yesteryears of Westworld. Since Dolores has been around a while, she has some, let's call them bloody and unpleasant, memories of that town. So, William tries to be a good guy and get her out of there, which is where the real trouble arises. Logan (Ben Barnes) is alive! How wonderful you guys! Oh, wait. No, it isn't. Remember how Dolores and William totally left him to die? Yeah. So we'll see how that shakes out, but Logan didn't make it seem as though he was going to go the way of mercy on this one. 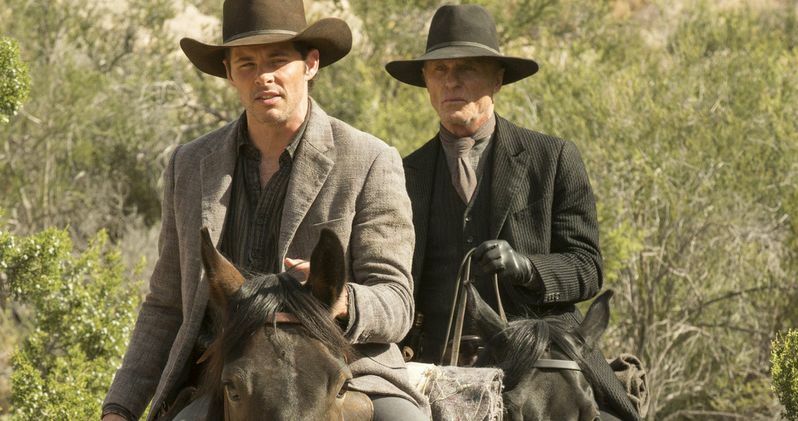 We also caught up with The Man in Black (Ed Harris) and Teddy (James Marsden) who are making progress, seemingly real progress, on their quest to find the evil Wyatt, who we now know for sure is the big bad in Dr. Robert's new narrative. They find that robot Angela (Talulah Riley) who looks as though she has been hurt and needs help. Damsel in distress, that old bit. Of course, it was Wyatt's big bad gang that was responsible, and then a monster showed up! No, really. What was that thing? It wasn't quite a person robot, because it growled like a monster and was huge. Teddy killed it, but during the fight, he just so happened to recall that The Man in Black didn't' treat Dolores so nicely in the past. So Teddy gets some payback and beats him up and ties him up. While Teddy is pressing him for information, The Man in Black actually revealed a lot about his life outside the park, and that is the first real clue we've had about who he really is. Apparently, he is a "god" and a "titan of industry" who had a wife and daughter. Sadly, his wife killed herself because she hated her life, more specifically her life with The Man in Black. His daughter blamed him for it and his life was left in pieces. That is why he is on this journey to find the maze, which we now know is a game of Arnold's design. Not only that, but we know that moment that Maeve keeps reliving with her and her daughter's murder was a test for The Man in Black to see how evil he really could be. Why was that significant? Because that is when he found out about that maze! It is all connected! That was actually a really cool moment. Sadly, things were cut short when Wyatt's men arrived and Angela revealed she was something of a double-crosser and stabbed Teddy with an arrow. That is where we left off! Lot's of loose ends and a whole lot of momentum building. Oh and nobody else seems to know that Bernard is a robot since he returned to his job with a newly wiped memory, but Ashley (Luke Hemsworth) seems to have his suspicions. Also, we still don't know what happened to Elsie (Shannon Woodward). And who is Arnold?! Get on it, HBO! Because we only have two weeks for all of this dust to settle. Or maybe they will mess with us and leave us with a big cliffhanger for season 2. We will have to wait and see when Westworld returns next Sunday on HBO.